One whiff of this prawn pulao takes me back years, or is it a couple of decades back to when I was growing up (yikes, I feel old now). My mum used to make this pulao for us. I grew up in a house of prawn lovers. Yes, you heard that right. 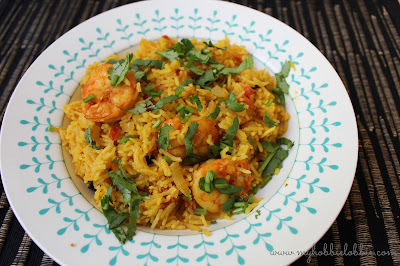 Mum has a few go to recipes for prawns - this Prawn Chilly fry with Coriander speckled rice (my absolute favorite), a Goan prawn curry (I still cannot get mine to taste like hers so I will get her to make me some for the blog) and this prawn pulao. This prawn pulao is pretty amazing. It is a meal in itself served with a nice, light, fresh salad alongside. It comes together fast and easy and if you love prawns like us, you'll be glad to have this recipe to fall back on. Throw in a few drinks and you could make this to serve a crowd too. The recipe below makes 2 generous portions if served as a meal. If you intend making a larger quantity, you just need to keep in mind the rice to water ratio. As long as you use 1 portion of rice to 2 portions of water, you'll be fine. All the other ingredients can be multiplied and adjusted to suit your taste. As long as the rice and water ratio is right, you will be left with a perfect rice dish. It wont be mushy, the grains will be whole, the rice will be fluffy and all will be well. Marinade the prawns with some salt, a little lime juice, turmeric and chilly powder and keep it aside for 15-30 minutes. Wash the rice and drain the water. You will need to do this about 2-3 times, till the water runs clear. Place a tablespoon of oil in a frying and and when it is hot, carefully place the prawns in the pan without over crowding the pan. Fry the prawns till they turn opaque with a little char and flip them over and let them char on the other side too. This takes just a couple of minutes, don't leave them unattended. You just want some color on the outside. They don't need to cook all the way because they will continue to cook with the rice. Take the prawns out of the pan and keep aside. Heat a tablespoon of olive oil in the pot that you want to cook the rice in. Add the cloves, bay leaves, cardamom pods, pepper corns and cinnamon. In a few seconds, the spices will smell fragrant. Add the onions to the pot. Saute the onions till they have softened. Add the ginger garlic paste and let it cook of for a minute. Add the turmeric powder and the sliced chilly and stir it up. Add the tomato and stir well. Drain the rice and run some fresh cold water through and drain it again. Add the rice and the fried prawns to the pot and stir gently till the rice and prawns are coated with the spices. Season with some salt and add the water. Stir a little and check the seasoning. I taste a little of the stock and see if more salt is needed. When the water comes to a boil, cover the pot and lower the heat to a simmer. Let it cook till all the water is absorbed. As soon as all the water is absorbed, take the pot of the heat and leave aside covered for a couple of minutes. Loosen the rice gently with a fork. Serve hot and sprinkle the chopped coriander over the rice just before serving.